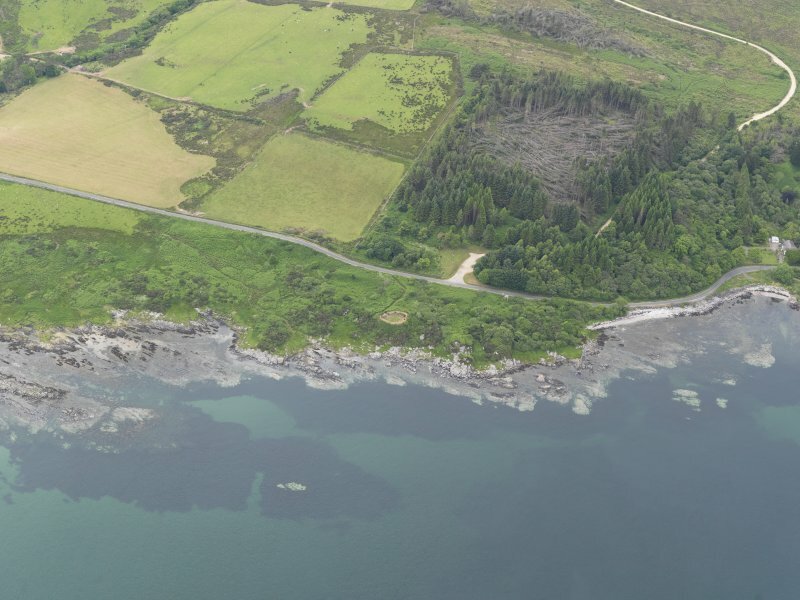 Oblique aerial view centred on the remains of the Kildonan Bay dun, taken from the ESE. 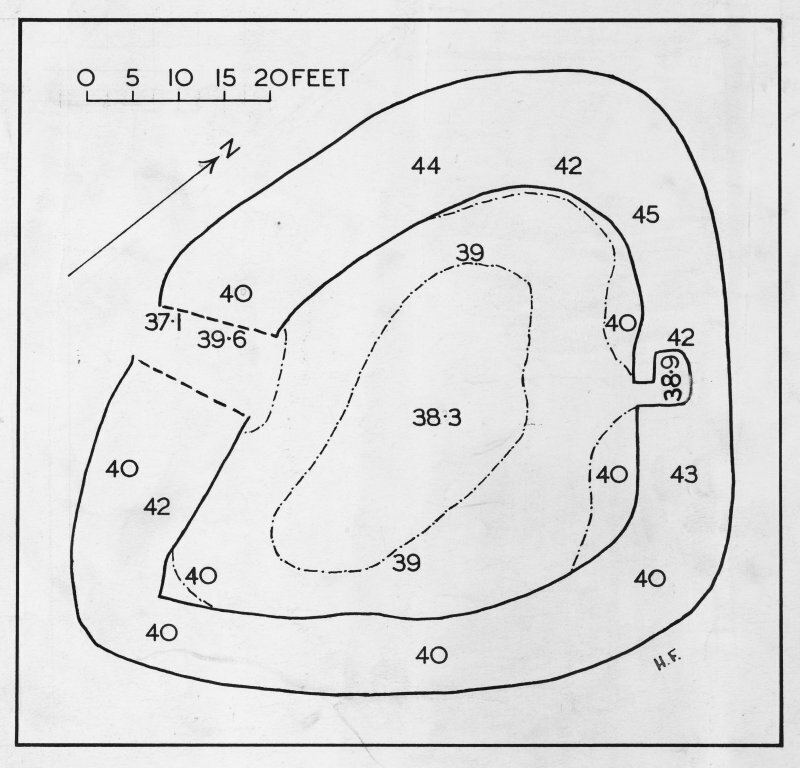 Excavation drawing : plan of Kildonan fort. PSAS LXXIII fig 9. 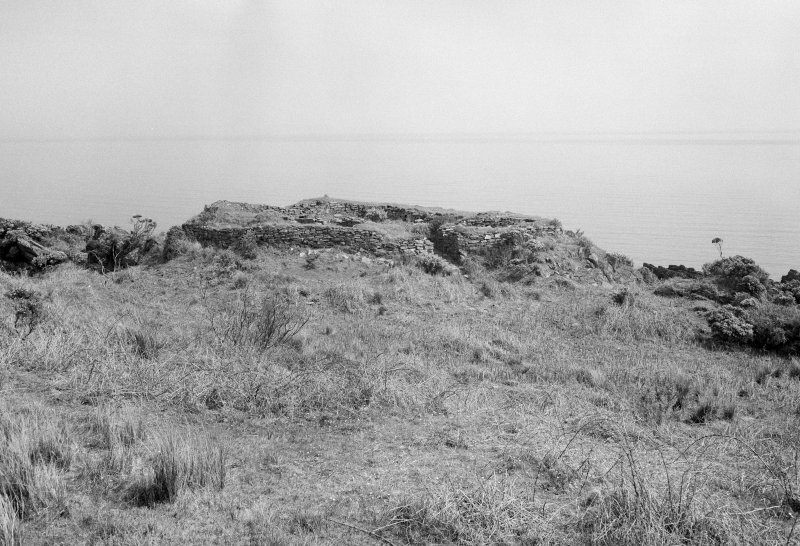 (NR 7804 2778) Fort (NR). 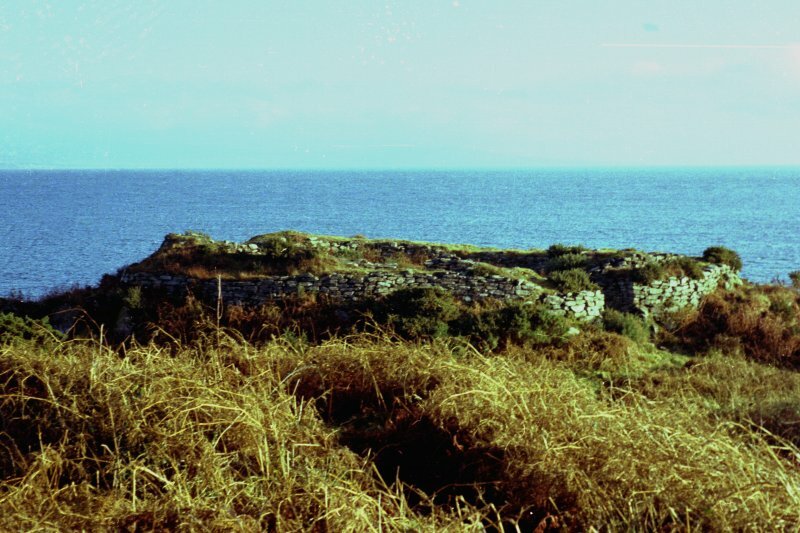 A well-preserved dun, crowning a rocky knoll and measuring 19.2m by 13.1m within a wall 1.5m to 4.3m thick, composed of a rubble core faced with boulders, and having an internal revetment. For a distance of 5.5m south of the entrance in the SW, this revetment is replaced by a narrow, curving gallery open at both ends. The inner face of the wall is set at a higher level than the outer and on the north stands to its original height of a little over 2.1m, but elsewhere is only about 1.2m high. The outer face exhibits a marked batter and is now 2.4m in maximum height but it may originally have been 3.7m high at the entrance, and as much as 4.6m in places along the east side. The entrance, 1.65m to 2.59m wide is paved and provided with door-checks and bar-holes. 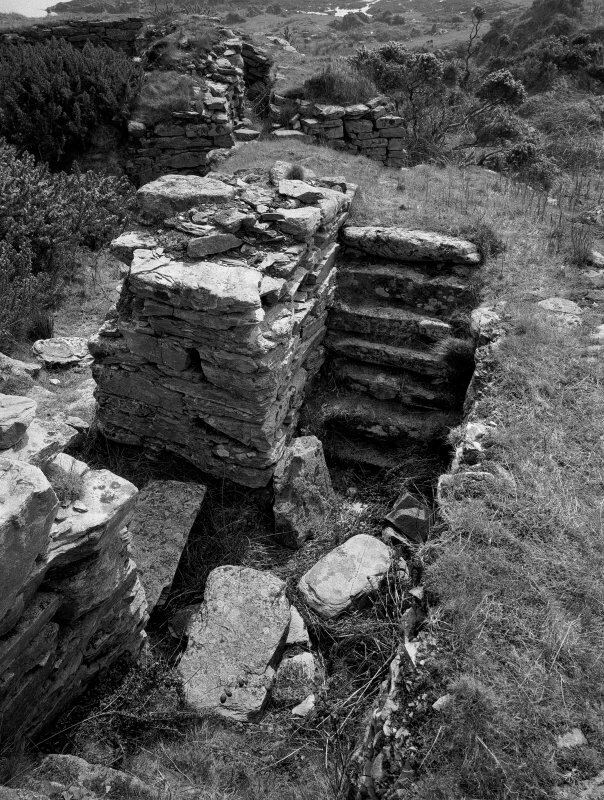 From the interior of the dun a short passage on the NE leads to a mural cell which has lost its corbelled roof; and another opening on the west gives access to twin staircases built against the internal revetment. 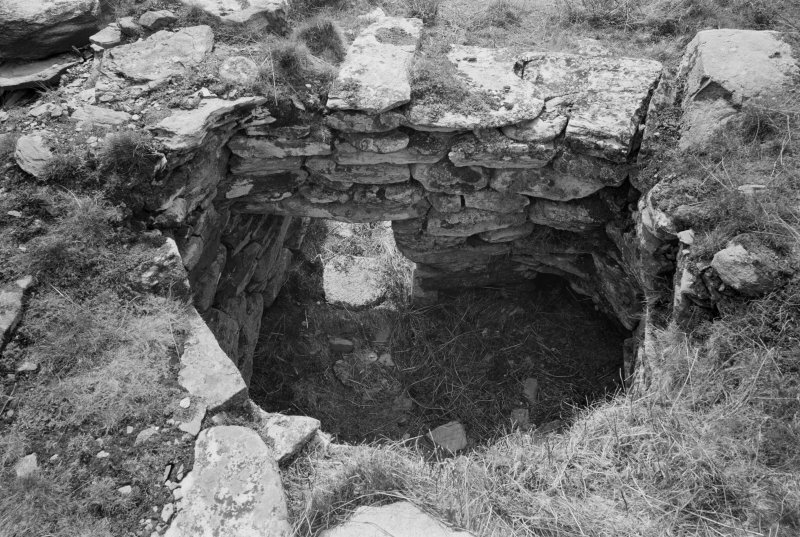 Excavations between 1936 and 1938 indicated that there had been several occupations and modern excavations at comparable sites indicate a primary occupation in the late first or early second centuries AD. Kerbed hearths and what were thought to be the foundations of small huts were associated with this period and among the finds was a single, small sherd of samian. A 9th century bronze penannular brooch indicated Dark Age occupation and the site was again re-occupied between the late 12th and early 14th centuries. 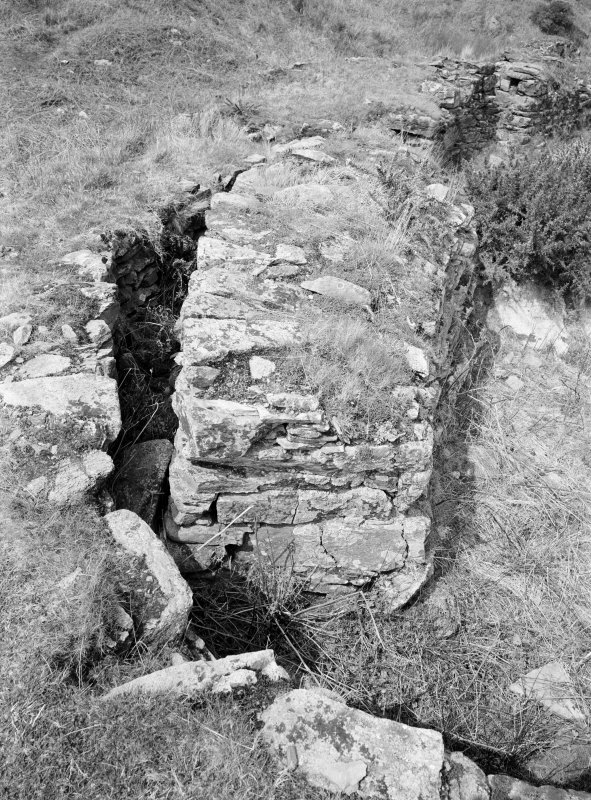 In final phase, which cannot be dated, the interior of the dun appears to have been adapted for use as a stock enclosure. H Fairhurst 1939; RCAHMS 1971, visited 1960. The dun is as described and illustrated by the previous authorities. Visited by OS (JB) 8 November 1977. Sounding below Fairhurst's Period II Hearth 2 (vide PSAS 1939) in order to recover assays for C14 dating yielded quantities of charcoal, part of an iron knife, a mica schist disc, two socketed stones (mortars) and a paved area attributable to the first phase of occupation. E Peltenburg and F Hood 1979. NR 7806 2778 Site identified as part of a coastal zone assessment survey. M Cressey, S Badger, 2005. This D-shaped dun is exceptionally well preserved with the outer and inner face surviving to a height of over 2m externally. 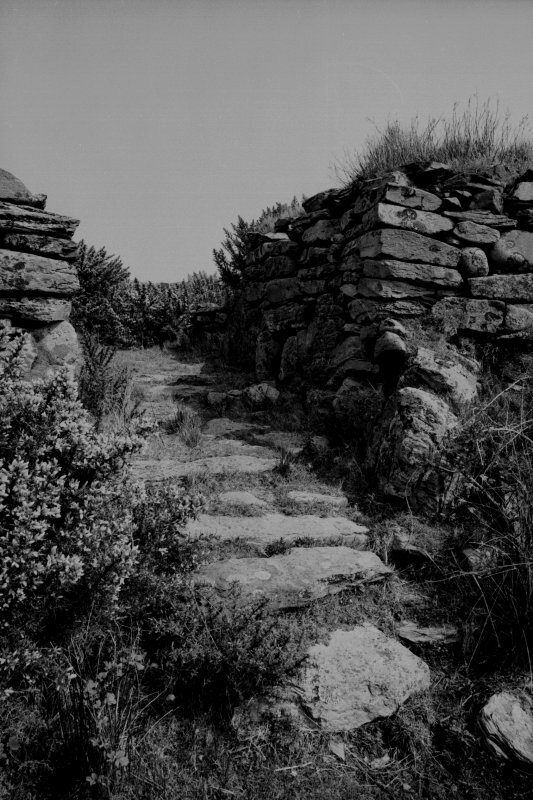 The shape of the dun, which measures about 19m by 13m internally, is partly dictated by the rock stack on which it was built; its preservation is due, at least in part, to the use of an inner revetment within the wall (an inward facing slab construction) still visible in several places. The main features of interest are the entrance, a double staircase within the wall and a cell within the wall on the northeast side. The impressive entrance has door checks, against which a stout timber door might be placed, and bar-slots to accommodate the beam to keep the door in position. 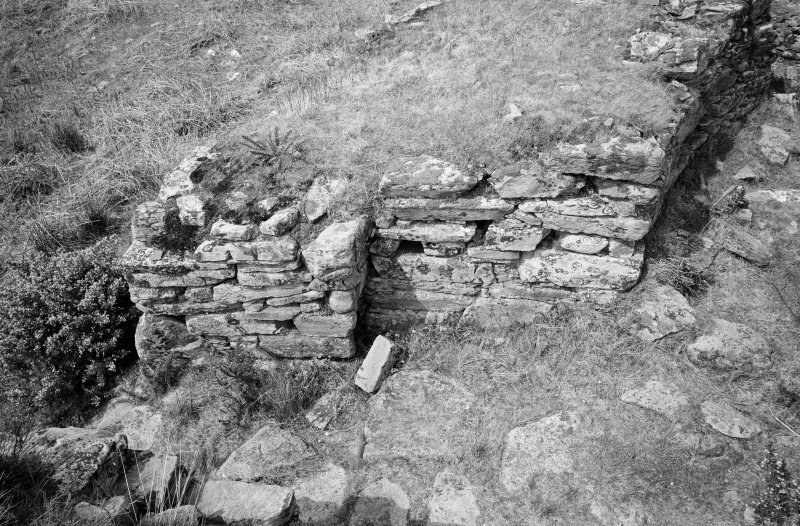 The wall to the south-east of the entrance is in two distinct thicknesses, doubtless a device to improve the stability of the dun. On the west side of the wall the twin flights of steps provide access to the wall head. On the north-east side there is a small cell within the thickness of the wall. Excavations between 1936 and 1938 and again in 1984 have revealed a rich assemblage of fmds including pottery and metalwork indicating three periods of occupation: the construction of the dun in the 1st or 2nd century AD; its re-use, coupled probably with rebuilding, in about the 9th century AD; there was finally a re-occupation between the late 12th and early 14th century AD.